PO Box 1065, San Rafael, California 94901." ^ Sylvan, Robin (2002). Traces of the Spirit: The Religious Dimensions of Popular Music. NYU Press. pp. 86-. ISBN 978-0-8147-9809-6. https://books.google.com/books?id=vXJikQ7FNUsC&pg=PA86. ^ Garofalo, Reebee (1997). Rockin' Out: Popular Music in the USA. Allyn & Bacon. ISBN 0205137032. p. 218. ^ Jackson, Blair (August 1, 2000). Garcia: An American Life. Penguin. p. 272. ISBN 978-0-14-029199-5. https://books.google.com/books?id=w3y3PbFPNe4C&pg=PA272. ^ Selvin, Joel (December 9, 1995). "End of the Road for Grateful Dead; Without Garcia, Band Just Can't Keep Truckin'", San Francisco Chronicle. Retrieved July 1, 2015. ^ Selvin, Joel (December 1, 2002). "Other Ones Reunite", San Francisco Chronicle. Retrieved July 7, 2015. ^ "The Dead", Grateful Dead Family Discography. Retrieved July 9, 2015. ^ Budnick, Dean (September 18, 2013). "Dead Behind, Furthur Ahead", Relix. Retrieved July 7, 2015. ^ Blistein, Jon (November 4, 2014). "Phil Lesh and Bob Weir Disband Furthur", Rolling Stone. Retrieved July 7, 2015. 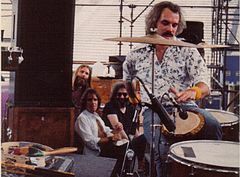 ^ "Rhythm Devils Featuring Mickey Hart and Bill Kreutzmann Announce Summer Tour", KindWeb, May 27, 2010. Retrieved July 7, 2015. ^ Selvin, Joel (February 2006). "RatDog’s Return: Bob Weir and Life After Dead", Relix. Retrieved July 11, 2015. ^ Greenhaus, Mike (February 14, 2014). 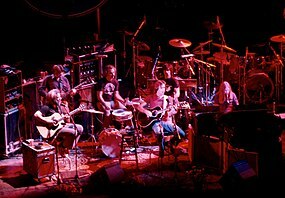 "Bob Weir Ramps Up RatDog", jambands.com. Retrieved July 11, 2015. ^ Simon, Richard B. (June 2002). "Phil Lesh Goes There and Back Again", Relix. Retrieved July 11, 2015. ^ Sisario, Ben (March 15, 2015). "Ex-Bassist for the Grateful Dead Strikes a Deal", New York Times. Retrieved July 11, 2015. ^ Foster-Patton, Kathy (September 2006). "Micky Hart's Planet Drum Returns", JamBase. Retrieved July 10, 2015. ^ "Interview: Mickey Hart", Digital Interviews, August 2000. Retrieved July 10, 2015. ^ Hutchinson, Nick (March 16, 2009). "Concert Review: Bill Kreutzmann Featuring Oteil Burbridge and Scott Murawski, Fox Theater, Boulder, CO", jambands.com. Retrieved July 8, 2015. ^ Powell, Austin (November 25, 2010). "Swampadelic: 7 Walkers Rise from the Dead", Austin Chronicle. Retrieved July 8, 2015. ^ Bernstein, Scott (March 29, 2015). "Concert Review: Billy & the Kids, Capitol Theatre, Port Chester, NY", JamBase. Retrieved July 8, 2015. ^ Selvin, Joel (June 3, 2008). "Donna Jean Godchaux Grateful to Sing Again", San Francisco Chronicle. Retrieved June 7, 2015. ^ Tamarkin, Jeff (September 2, 2014). "Deadicated: Tom Constanten", Relix. Retrieved July 7, 2015. ^ Sallo, Stewart (July 10, 2015). "Grateful Dead 'Fare Thee Well' Report Card", Huffington Post. Retrieved July 12, 2015. ^ Halperin, Shirley (January 16, 2015). "Grateful Dead to Reunite, Jam with Trey Anastasio for Final Shows", Billboard. Retrieved July 6, 2015. ^ "Peter Shapiro: "We're Working on a Way to Bring the Show to Fans Who Aren't in Soldier Field", Relix, March 3, 2015. Retrieved July 6, 2015. ^ Coscarelli, Joe (July 2, 2015). "As Grateful Dead Exit, a Debate Will Not Fade Away", New York Times. Retrieved July 6, 2015. ^ Grow, Kory (June 25, 2015). "Grateful Dead Announce Box Set Releases of Final Concerts", Rolling Stone. Retrieved June 28, 2015. ^ Halperin, Shirley (August 5, 2015). "The Grateful Dead Is Resurrected Once More, This Time with John Mayer", Billboard. Retrieved August 6, 2015. ^ Varga, George (September 10, 2015). "Grateful Dead Alums Dead & Company Add More Tour Dates", San Diego Union-Tribune. Retrieved September 10, 2015. ^ Jackson, Blair (1999). Garcia: An American Life. Penguin Books. p. 67. ISBN 0-14-029199-7. ^ Paumgarten, Nick (2012-11-26). “Deadhead: The Afterlife”. The New Yorker. http://www.newyorker.com/magazine/2012/11/26/deadhead 2015年7月7日閲覧。. ^ “Disaster at Altamont: Let It Bleed”. Rolling Stone. (21 January 1970). 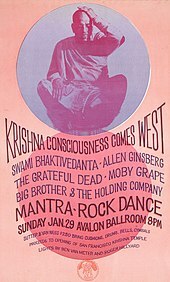 http://www.rollingstone.com/music/news/the-rolling-stones-disaster-at-altamont-let-it-bleed-19700121?page=12 2016年3月18日閲覧。. ^ a b Weiner, Robert G. (1999). 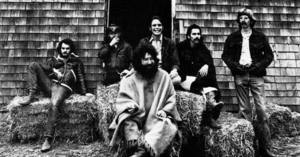 Perspectives on the Grateful Dead: Critical Writings By Robert G. Weiner. Greenwood Publishing. p. xvii. ISBN 0-313-30569-2. ^ Scott, David Meerman & Hlligan, Brian. Marketing Lessons from the Grateful Dead: What Every Business Can Learn From the Most Iconic Band in History. ISBN 0-470-90052-0. ^ Rome: A Holiday Magazine Travel Guide. New York: Random House. (1960). ^ Scott, John W.; Dolgushkin, Mike; Nixon, Stu. (1999). 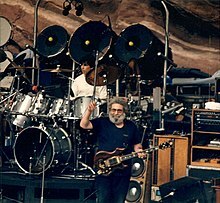 DeadBase XI: The Complete Guide to Grateful Dead Song Lists. Cornish, NH: DeadBase. p. 565. ISBN 1-877657-22-0. Allen, Scott W. (2014). Aces Back to Back: The History of the Grateful Dead (1965 - 2013). Outskirts Press. ISBN 978-1478719434. Lesh, Phil (2005). Searching for the Sound: My Life with the Grateful Dead. Little, Brown and Co.. ISBN 0-316-00998-9.